This is the single-news section of the marathonrally.com news "Offroad & Motorsports". To see all news please use the link under the article or navigate with the left main-navigation. Dakar 2007: X-Raid reaches finish with Al Attiyah in sixth position. Qatar’s Nasser Saleh Al-Attiyah and French co-driver Alain Guehennec finished the 29th Dakar Rally in sixth position in the overall standings, after a harsh speeding penalty was imposed by event officials on the eve of the final stage and this dropped the Qatari from fourth to sixth in his BMW X3CC. But the implications of the penalty for alleged excess speed in a speed control zone also robbed the X-Raid Team of victory in the coveted diesel category, which fell to fourth-placed Mark Miller. 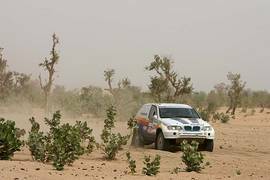 After the results for the Tambacounda to Dakar stage had been declared provisional, the result of GPS data from the cars was analysed and various speeding penalties were imposed on cars that had been deemed to be over the required speed limit in populated areas. 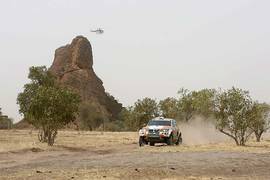 Al-Attiyah and Guehennec were among the crews deemed to have been speeding on the stage into Dakar and event officials imposed a stringent penalty of 90 minutes on to the Qatari's overall time. This, coupled with the 39 minutes that had been added to his time following a previous speeding infringement in Morocco, cost the X-Raid Team its fourth place. The penalty also reduced the emphasis on the penalty that the X-Raid team had appealed against and meant that Jean-Louis Schlesser was secure in third overall - the final podium position. "I am sure that there was a mistake with the system, because I braked before the control zone, especially as it was only around seven metres into the zone where the measurement was taken," said Al-Attiyah. "This is a real disappointing end to the race for me. The team did a great job to get us to fourth position and we were all set for the diesel victory. We have proved that the BMW is strong, reliable and competitive, but it is so frustrating to lose fourth, and even third place, because of time penalties." "This is more than disappointing," said X-Raid Team Director Sven Quandt. "I spoke to our team over the last few days and told them to be careful of the speed restriction zones. I will still pursue the appeal over the original time penalty of 39 minutes, because this was imposed incorrectly. But this new penalty means that we can no longer take third place. The organisers have increased their emphasis on safety this year and speed restrictions have been supported by all teams. But the equipment is not fool-proof and the penalties have not been imposed fairly at all. It is a disappointing end to a very successful event for us and leaves a bitter taste in the mouth." German driver Jutta Kleinschmidt and Swedish co-driver Tina Thörner arrived at Lac Rose in 15th overall and saved their best to last to set the sixth fastest stage time around Lac Rose. "We discovered that the lack of power we had experienced was down to a turbocharger problem and, once this was repaired, our stage time yesterday was a reflection of our capabilities. Still, we reached the finish and learned a lot from the experience." Spaniard José-Luis Monterde and Jean-Marie Lurquin set the 12th fastest time on the day’s stage and reached Lac Rose in 16th overall, while Brazilian Paulo Nobre and co-driver Filipe Palmeiro finished 37th overall.